Slipped Disc | Why is there a tractor in the Opéra de Paris? Why is there a tractor in the Opéra de Paris? 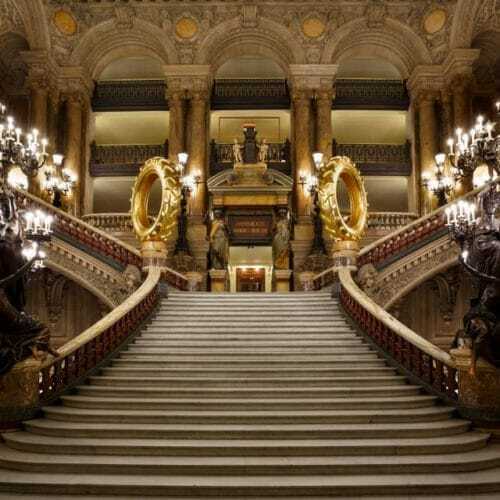 Following the latest outbreak of bucolic realism at Bavarian State Opera, Paris has gone one better with a pair of painted tractor tyres on the gilded staircase of the Palais Garnier. Apparently, it’s an art installation by Claude Lévêque. If the tyres were painted gold as you say, it is bucolic realism. If, however, they were actually gilded in gold it could be a post-modern scream of outrage against the gender pay gap. On the subject of Prodaná nevěsta at Bavarian State Opera, it should be noted that a brilliant Czech (Tomáš Hanus) was hired to conduct the Czech score, an imaginative Slovak (Pavol Breslik) to sing Jeník, and the world’s smartest bass (Günther Groissböck) assigned for Kecal — only to have Jeník turned into Hans, Kecal into Kezal, Mařenka into Marie, and Vašek into Wenzel, to match Max Ophüls’ locally beloved 1932 movie, Die verkaufte Braut. I saw the Munich show last Sunday. Everyone complaining about the tractor on the stage can be told that that should be the least of their worries. The whole direction by Herr David Bösch was just ghastly – no Bohemian spring but German Regietheater gloominess full of sexual innuendos and other stupid ideas. The essay by conductor Hanus on choosing the German translation are very worth reading. The singing by Pavol Breslink, Selene Zanetti and Günther Groissböck was very good. Watch for a DVD of a 1982 staging at the Vienna State Opera with Lucia Popp and Siegfried Jerusalem. Luckily, the singing all round was excellent and Marie/Marenka seems to be a very promising young singer. I can appreciate that not everyone cares for cutesy folklore and might prefer an update but why did it have to be so bloody UGLY? And why no dancing, with a score that absolutely cries out for it? I always think of “The Bartered Bride” as being a hymn to all things Czech, so why set it just anywhere? Made me feel quite nostalgic for the old Peter Dworsky/Gabriela Benackova film! When did they put them there? I was at the Palais Garnier on the Christmas Day to see the Dame with Camellias. There were no tractor tiers on the staircase. It went up on December 30.